This is an old intelligence trick called "Poisoning the well", the intentional promotion of lies to blend with an embarrassing truth to discredit it. And the intensity with which the propagandists are pushing this no-plane nonsense is easily explained by the fact that they have nothing else at all with which to defend the official story. 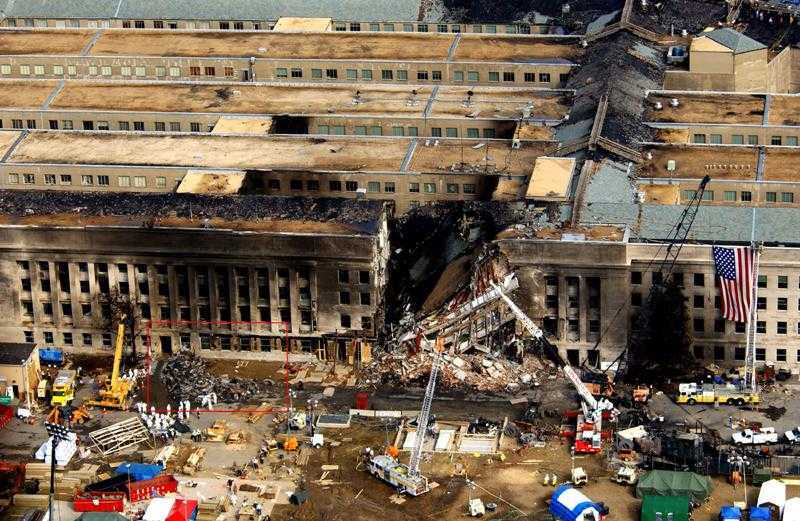 The sheer fury with which this story has been met both here at WRH and over at the radio show betrays a sense of panic within the government that the American people know 9-11 was a war-starting hoax. "No plane" is the last card they have to play. The "no-plane" propaganda is a trap set to discredit the 9-11 truth movement. Once the propagandists are able ot trick the majority of the 9-11 truth movement into going along with this nonsense (or failing that, create the public illusion that the majority of the 9-11 truth movement are going along with this nonsense), one of the confiscated videos that clearly shows the 757 slamming into the Pentagon will be made public, to discredit the entire 9-11 truth movement in one fell swoop, silencing those questions the government cannot answer. To play this trick, the "no-planers" are promote an incredibly complex conspiracy to hide a missile, while denying the possibility of an equally complex conspiracy to plant the illusion of one. Let's take an example from history which nobody here is emotionally invested in. After the John F. Kennedy Assassination, New Orleans Prosecutor Jim Garrison placed Clay Shaw (later admitted by Richard Secord to have been a CIA asset) on trial for the conspiracy. The case was going very well until a witness showed up who claimed to be able to link Oswald directly to Shaw. Once on the stand, however, the witness started blabbing about how he fingerprinted his own daughter every night to prevent "them" from replacing her with a duplicate. Although not shown in the Oliver Stone film, "JFK", it was this one planted witness that "poisoned the well" of Garrison's case, resulting in Clay Shaw's acquittal. In the 1990s, around the time of Ruby Ridge and WACO, the Congress was forced to hold public hearings on the abuses of the BATF, hearings which were notable for one witness showing up wearing full camo, and demanding the government declassify its secret tornado making machine. That provided the sound byte the media used to make anyone who stood up to the BATF look like a nutcase. The "witness" was later outed as an FBI informant. Another example of "poisoning the well" is in the Killian documents, which documented George Bush's machinations to avoid the Vietnam draft by joining the Texas Air National Guard. Five of the documents were authentic, but the sixth was an obvious forgery planted on CBS in order to cast doubt on the authenticity of the others. Ever since this "no-plane" theory has been planted on the 9-11 truth movement, the corporate media inevitably seizes on it as a means to ridicule those who do not accept the official story of 9-11. One obvious example is the March 2005 issue of Popular Mechanics, which used the "no-plane" theory to summarily dismiss any and all doubters of the official story as a munch of nuts that all correct-thinking loyal Americans should ever listen to. Which is what the no-plane hoax is intended to do. I will sign off this discussion by reminding you all once more that while the US Government will not hesitate to lie, cheat, steal, and hoax you, they never do it without a good reason. As I stated before, there is no reason for the government to substitute a missile for the crashing plane at the Pentagon. But there is plenty of reason for the US Government to trick you into thinking that they did! Lately, in their efforts to plant more bogus information on the web for the media to use to ridicule doubters of the official story, the shills have used over-processed and blurry photos of the 9-11 planes to claim that they carried "pods" on the outside (which the ground crews at all the airports somehow never noticed). For that reason, the government shills have come to be known as the 9-11 "Pod People". 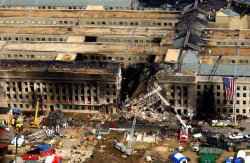 In response to the question of "where is the wreckage of the plane", the answer is that much of the wreckage slid into the ground floor of the Pentagon. It slid INTO the building, into the first floor space, starting a fire in the first floor, whereupon the upper floors later collapsed down onto the remains of the aircraft. Most of the aircraft wreckage is therefore under the collapsed roof section in the photo. So where is the rest of the wreckage from the passenger plane? Right in plain view, for those who actually look. In the above copy of the wide area view, a red rectangle marks an area to be examined. This area appears below. Click for larger image of the insert The Pentagon is a building mostly made of concrete and wood. 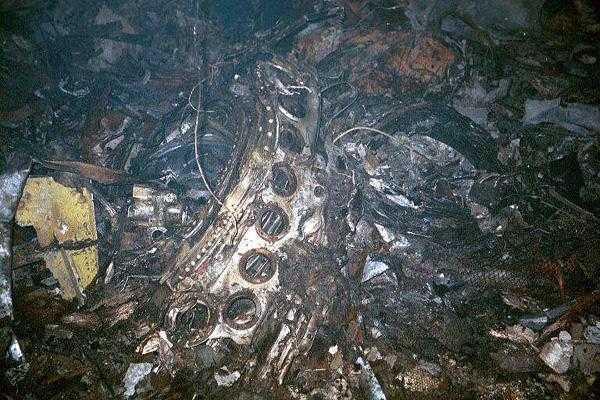 Yet here is a pile of crumpled aluminum debris, and clearly seen mixed in with it are pieces of luggage. 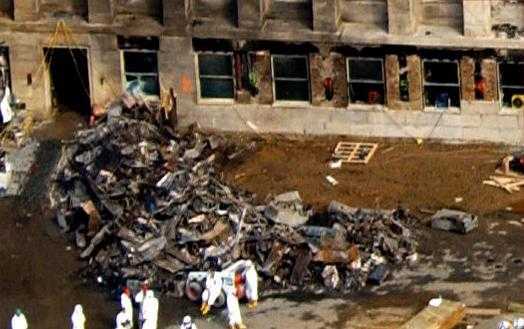 Since the Pentagon itself does not travel, we can conclude that the luggage (and the aluminum shards mixed with them) are part of the remains of the passenger jet which hit the Pentagon. 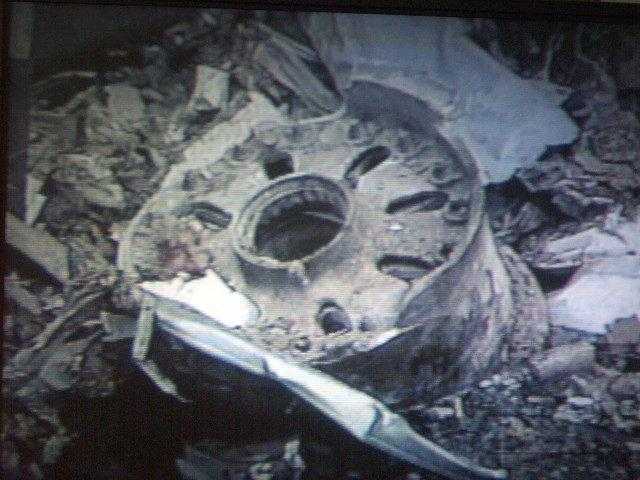 In similar crashes, the resulting debris was in small pieces, 6 feet long at most. 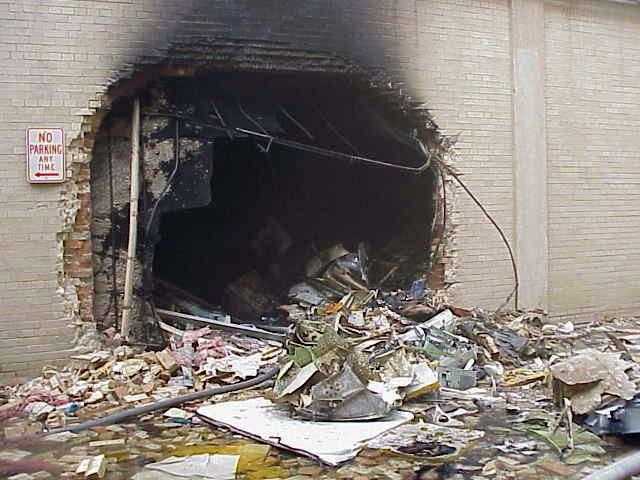 You don't SEE huge pieces of airplane sitting at crash sites in head on collisions such as slamming into the wall of the Pentagon. Despite their impressive size, aircraft and relatively fragile objects due to weight considerations. 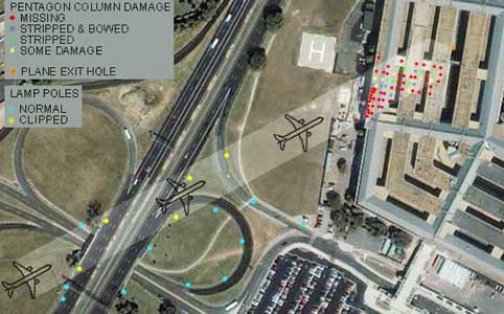 The claim by the "no-planers" that there is no identifiable wreckage of a 757 at the Pentagon is contradicted by the photographic evidence. Take a glass Christmas ornament and hurl it against a brick wall. Do you get a round opening in the brick wall the size of the ornament? No, of course not. 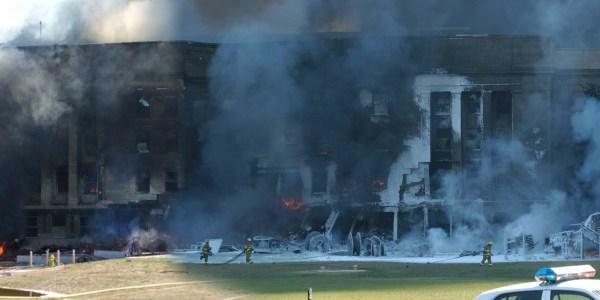 Neither will an aluminum plane leave a clean outline of itself crashing into concrete. 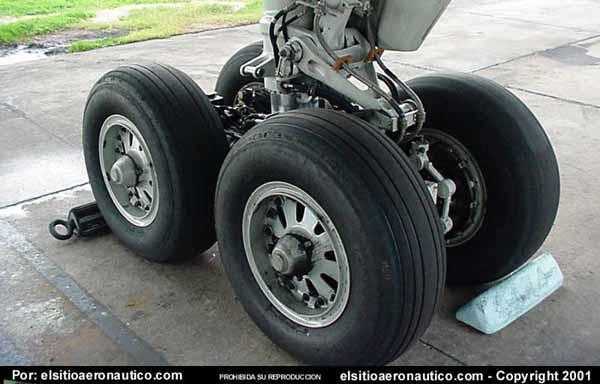 In the case of the plane, there are subassemblies which are heavy and solid, such as the engines, the frames supporting the landing gear, cockpit avionics, the potable water tanks, APU, etc. On impact, these would break loose from the aircraft and continuing forward, produce smaller holes. But the fuselage would crumple like aluminum foil. 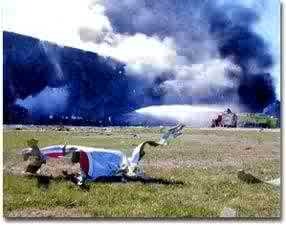 The "Pod People" will no doubt scream that the above photos are fake, just as they have insisted that all the photos which show debris at the crash site are fakes, and just as they scream that the witnesses to the passenger jet at the Pentagon "have to be" wrong. But witness-smearing is the exact same tactic the government has used to silence contradictory witnesses from JFK to the shoot down of TWA 800 to the 9-11 false flag. As the "Pod People" use the same tactics, they reveal who they really are. "I was in the left hand lane with my windows closed. I did not hear anything at all until the plane was just right above our cars." 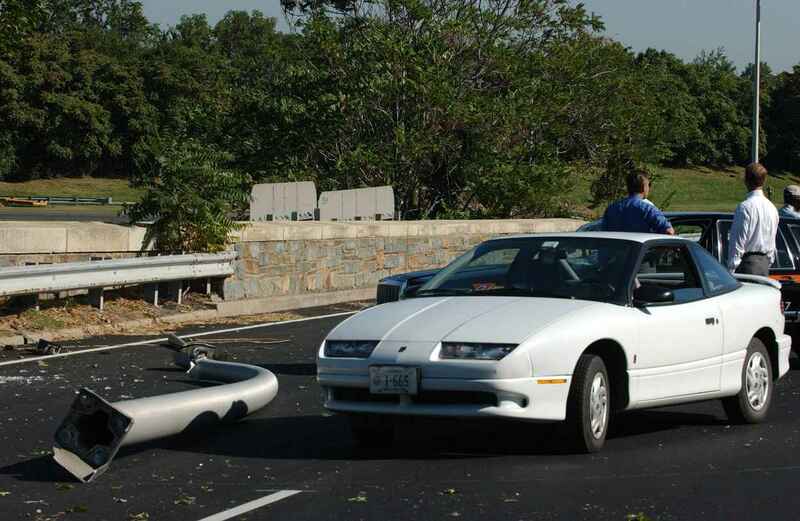 [Father Stephen McGraw] estimates that the plane passed about 20 feet over his car, as he waited in the left hand lane of the road, on the side closest to the Pentagon. "The plane clipped the top of a light pole just before it got to us, injuring a taxi driver, whose taxi was just a few feet away from my car." Click image for full size << Photo showing light pole debris. Note the cab behind. An analysis of the stills. "The plane atomized with the impact, it just disappeared into dust - only the tips of the wings escaped total destruction. But the wall, designed to move and absorb energy, did its job well." 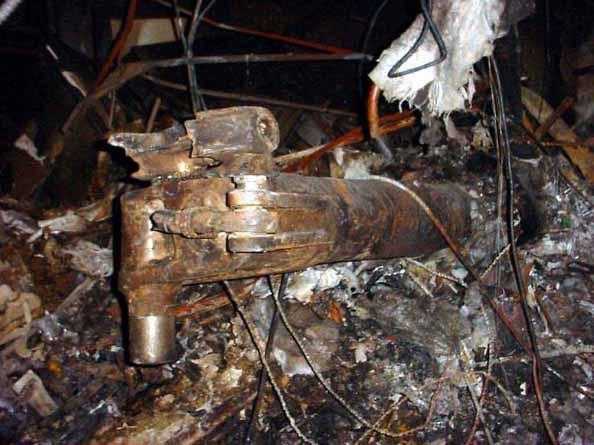 The above was a test where an F-4 fighter jet (fighters are built more sturdy than passenger jets in order to survive despite combat damage) was slammed into a test wall to evaluate the damage that might be caused if a jet plane was crashed into a reactor containment vessel. The wall in this test was considerably stronger than the Pentagon wall and suffered little damage. However, that damage was found to be primarily from the engines of the F-4, whereas the rest of the airframe shattered on impact without damaging the wall at all. This test proves that the Pentagon damage would come not from the aircraft as a whole, but from the heavy and dense components such as the engines, landing gear blocks, avionics, potable water bottles, etc. The government released images from just one camera at the Pentagon, that does not show the incoming object. But there was another camera whose images were never released, but had to be pried loose using a FOIA lawsuit. Those images clearly show the passenger jet skimming along the ground. 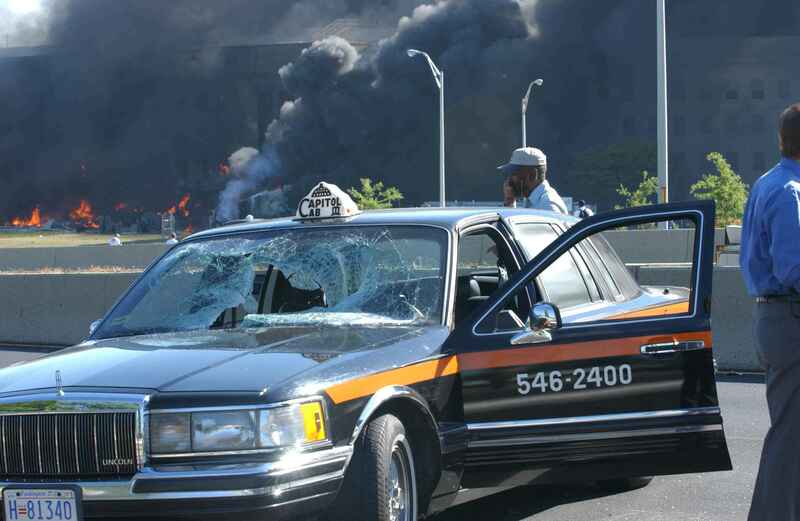 PICTURES OF THE PENTAGON IMPACT AREA BEFORE THE COLLAPSE. In the second picture the impact area of the aircraft has been roughly outlined. American Airlines Flight 77, a Boeing 757. If you want to read all the individual quotes you can start here. What happens to an airplane hitting a solid wall.